Ever wanted to ask Cindi Leive, the editor-in-chief of Glamour, a question about diversity in fashion? If so, today’s your lucky day. If not, maybe tomorrow will be your lucky day. We really have no idea. 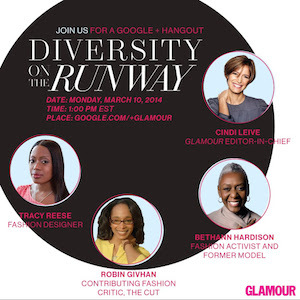 For those of you interested, Leive will be hosting a Google Hangout on diversity (or the lack thereof) in fashion at 1 pm. Leive will be joined by former model Bethann Hardison, The Cut’s contributing fashion critic Robin Givhan, and fashion designer Tracy Reese. You can watch the Hangout and submit questions to be answered live by clicking through.